Fred has called me last week to ask if I am still alive, as I haven’t posted for so long. I am not dead, I just haven’t had the time to sail. But finally I got some mothing done. I am currently on a business trip and I just arrived in South Africa. 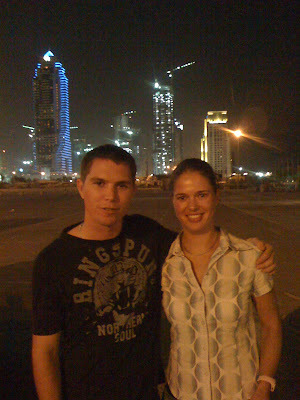 However I had a quick stop over (2days) in Dubai. There I have called Chris up, as I thought we could meet for supper. But Chris had another idea. He invited me to sail right away. Thus I went to the Dubai International Marine Club right after my last meeting at Wollongong University. There was a rigged up moth waiting for us. Chris has been really succesfull selling Bladeriders. He has sold more than 5 boats in the last 2 weeks. This means that there will be 11 boats in Dubai by the end of the year. Also there is going to be a big moth sailing event in March, which I would really like to attend. 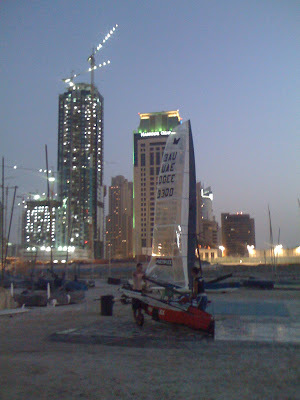 Dubai is one of the best sailing locations I have ever sailed at. Just amazing. After two hours of sailing we went out for dinner. Her you can see a picture of Chris and Kerstin. You are currently browsing the foilermoth blog archives for August, 2008.